Action from Phantoms' win over Basingstoke at Planet Ice. �2018 Tom Scott. All rights reserved. 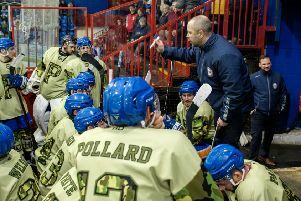 Peterborough Phantoms head coach Slava Koulikov was thrilled by a pre-season weekend packed full of positives. Import ace Ales Padelek hit a hat-trick as the city side beat Basingstoke 5-2 at Planet Ice last night (September 9) to follow up a 3-2 triumph in Hampshire the previous evening. A dust-up during Phantoms' win over Basingstone. �2018 Tom Scott. All rights reserved. That added up to an 8-4 aggregate victory in the Billy Glover Memorial Cup and Koulikov liked a lot of what he saw from his new-look roster. “Two wins is good for the morale of the guys,” said Koulikov. “We only started working together last Tuesday and there are many important things to fit into a short space of time. “There was plenty of improvement in our performances from Saturday to Sunday and from period to period. “The powerplay worked really well over the weekend and our netminder showed his quality at times – especially in the second period in Basingstoke. Glenn Billing was among the scorers for Phantoms against Basingstoke. �2018 Tom Scott. All rights reserved. A blank opening period last night was followed by a Phantoms goal blitz in the second session as they struck three times in less than seven minutes. All of the goals arrived in powerplay situations – just as their three goals had in the reverse fixture 24 hours earlier. Padelek made the breakthrough before new signing Harry Ferguson doubled the advantage. Padelek then struck again to leave Phantoms sitting pretty on aggregate and that position didn’t change as the two sides exchanged four quick goals in the final period. Player-coach Ashley Tait struck for Basingstoke on a powerplay before Padelek completed his hat-trick. Tom Ralph then made the most of another numerical advantage for Bison, but it drew a quick response from the hosts as Glenn Billing completed the scoring. Tempers then boiled over towards the end of an often feisty affair with simultaneous scraps breaking out as Phantoms player-coach Tom Norton traded blows with Liam Morris while Nathan Pollard and Ralph also went toe-to-toe. “We all know what he can do and it’s great to see him taking chances and scoring goals. There is nothing better than that for a forward’s confidence. Phantoms go into competitive action this weekend with two clashes against NIHL Division One North side Telford in the NIHL Autumn Cup. They expect to travel to Shropshire on Saturday (September 15) ahead of a return fixture at Planet Ice the following night (September 16), although it is somewhat farcically not yet set in stone with the Tigers also understood to listing their home fixture for the Sunday!